An attractive, well-maintained parking lot speaks volumes about your enterprise. Whether they are employees or customers, drivers prefer parking areas that are clearly marked, free from potholes and smoothly finished. If you need help with your asphalt maintenance or Sealcoating, Cinnaminson, NJ, area, Asphalt Pavement Solutions is the solution. For more than 30 years of business, the experts at Asphalt Pavement Solutions have provided outstanding service and quality work to customers throughout New Jersey, Pennsylvania, Delaware. We pride ourselves on offering the best results at the best prices. We have a number of corporate clients, such as leading retail chains, major shopping malls, residential customers and large institutions, who trust Asphalt Pavement Solutions with all of their asphalt repair and maintenance needs. • Repairs -- Asphalt is a flexible, durable surface. However, with time or heavy traffic, small cracks can form. Left alone, these cracks will continue to expand and frequently cause potholes. Water enters through these damaged areas and can compromise the integrity of the asphalt's base. Before you know it, your surface can be damaged so badly that it can no longer be repaired, requiring a complete resurfacing. • Sealing -- A professionally applied sealant not only improves the appearance of your asphalt surface, but it also protects against damages caused by salt, oil and gasoline leaks, ultraviolet rays and water damage. If you need sealcoating in Cinnaminson, NJ, Asphalt Pavement Solutions can provide you with the expert application you need. • Marking -- As our name implies, Asphalt Pavement Solutions is your asphalt marking expert in Cinnaminson. We can stripe your parking spaces, ensure your area complies with the markings required under the ADA and mark your crosswalks or "no-parking" zones. A well-maintained asphalt surface can easily last 25 years or more. The best return on investment occurs if a professional maintenance program is undertaken soon after construction -- this can often double the life of the surface -- but regardless of age, proper care can extend the life of your surface. 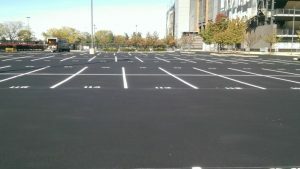 If you are interested in learning more about how Asphalt Pavement Solutions helps clients needing asphalt services and parking lot striping in Cinnaminson, send us your information via our convenient online form to obtain a free quote. If you prefer, you can call 1.856.288.1656. Asphalt Crack Repair -- There is no better way to limit pavement maintenance costs long-term than through repairing asphalt cracks. Our time-tested, economical system repairs cracks and extends the natural life cycle of your asphalt investment. Learn more about asphalt repair in Cinnaminson. Asphalt Sealing -- Ultraviolet rays are unfriendly to many things, including asphalt. Over time, UV light will dry out and therefore harden the asphalt. Untreated asphalt will actually lose thickness within just a few years. This can introduce erosion and raveling where there would be none with timely sealcoating. When combined with crack sealing, sealcoating substantially reduces water penetration. Especially in variable climates like Cinnaminson, the freeze/thaw cycle can wreak havoc on unsealed or improperly sealed asphalt. Sealcoating also offers essential protection against oil, gas, and salt. All of these substances can break down and weaken asphalt. Learn more about asphalt sealcoating in Cinnaminson. Asphalt repair -- Intelligent, selective repair of problem areas in your parking lot can forestall the need for that next re-paving. Our experts will work with you to determine the best approach in your particular situation. Overall, our comprehensive maintenance plan can often extend the life of your parking lot by 10-15 years. We look forward to understanding your needs and to earning your business. Learn more about asphalt repair in Cinnaminson, NJ. APS offers unmatched asphalt maintenance and asphalt paving in Cinnaminson, NJ and the surrounding areas. Call us at 1.856.288.1656 or visit our website.